Personalize and get creative with your own metalbind books with the GoldPress 4+ system. 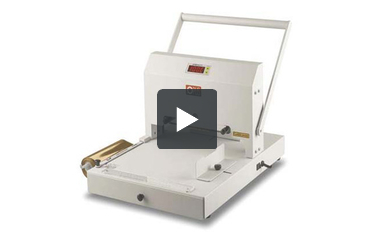 This hot stamping machine features a user friendly process to create an impressive result. Design the perfect reports, albums, company directories with logos and titles on hard covers or soft covers of different surfaces, sizes and textures. GoldPress help present a more personal touch with the foil embossing. The heavyweight construction allows for high volume usage and a long life of operation. An additional drawer has been incorporated into the machine for easy storage and clean ups. The extra stylish finish touch for all your need! Lets us add a foil stamp to our own binding covers. We had a custom die made but you can use fonts as well if needed. Welcome to MyBinding video. This video is a quick look at the Opus Goldpress 4+, a tremendous machine used for hot stamping stencils and logos on projects where you need a great finishing touch. Short and simply, this is how it works. First, you build your rack. Using letters with different fonts, numbers, and symbols, you can build your message or your logo right into this frame, lock it down, and place it into the machine. It slides just over the heating unit. With that in place, make sure everything is nice and even and leveled, and you can begin your project. The dials and settings for leveling are right here. And now let's take a plain cover and make it shine. When you've selected the cover that you want, place it into the machine and set your settings. This way you get things exactly where you want them and if you do multiple projects, they will all be consistent. There are size adjustments on the front, side, and back. And with your cover in place, and the machine turned on and warmed and ready to go to 214 degrees Fahrenheit, select the color foil that you'll be using. And with the shiny side up, place it just underneath the stamp head and on top of the cover. Bring down the handle so that it comes all the way to the bottom, let it rest for a second or two, and lift it back up. Carefully remove your project and slowly peel back the foil. And you're all done, very impressive. The Opus Goldpress 4+ is able to do different colors and on different textures and surfaces. Its setting and measuring flexibilities allow you to do larger and smaller documents, hard and soft covers, as well as printing directly on the metal bind channels, giving you a very impressive spine on your book. CD covers, photobooks, papers, and journals, there is really no limit to your creativity. That's the Opus Goldpress 4+. For more demos, reviews, and how-tos, check out MyBinding.com. Welcome to MyBinding video. 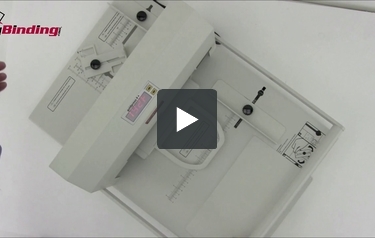 This is the unboxing and set up of the GoldPress 4+ by Opus, GoldCover hot stamping machine. Inside the box is an owner's manual with instructions and printed right on the base of the machine is a handy chart for quick reference. Inside the cardboard is a metal plate. This is used for leveling your table for the heating element to press down evenly on your project. According to the thickness of your project, there are several plates that you can adjust, remove, and add. And leveling is done with these three dials below the base plate. The power switch turns the unit on and begins the heating process. You can adjust the temperature at any point and the digital screen will let you know exactly where the machine is. The rest of the parts are all mechanical and very sturdy. There are three fences that are adjustable to allow you to set a setting so that all projects are consistent in your run. Ample measuring tools allow you to see just how flexible this machine is, accommodating very small and very large sizes. There's a large storage drawer in the front that comes with a few other parts with your purchase. Included is an introductory typeface set as well as some tools you will need every time you build a new stencil. The possibilities seem endless with hard and soft covers, CD covers, various different materials, and you can even print right on the metal bind channels. Now you've seen the Opus GoldPress 4+. For more demos, reviews, and how-tos, check out MyBinding.com. What is the largest sized die this can accommodate? Thank you for your question. The largest die that the Masterbind GoldPress 4+ Hot Stamping Machine would be able to accommodate would be 1.9" x 7" . do you carry more dies for this? letters? if so which link or url? Thank you for your question. The only stock dies that are available would be letters. We have them available in 4mm here and 9mm here . Other dies would need to be custom ordered. Give our customer service department we can start the process of getting you a quote on the custom die. other than letters; what kind of stamp/die can I use? specs? Thank you for your question. To use Masterbind GoldPress 4+ Hot Stamping Machine with a die other than letters, you would need to use a custom made die. Give our customer service department a call and we can help get a quote for a custom die. Does this work with different language letters... Chinese, Hebrew etc... can you supply this lettering? Thank you for your question. Unfortunately the only language of letters available as a stock item is English. If you are interested in getting a custom die made please reach out to our customer service department and we can work with the manufacture to get a quote. Will this machine work with standard lamination foil ? This machine is designed to work with standard hot stamp foils. These foils are very different than laminating foils and they are not cross compatible. Hot stamp foils require a die set, heat and electricity to imprint with pressure while lamination foils are designed to adhere to toner output on printed items.